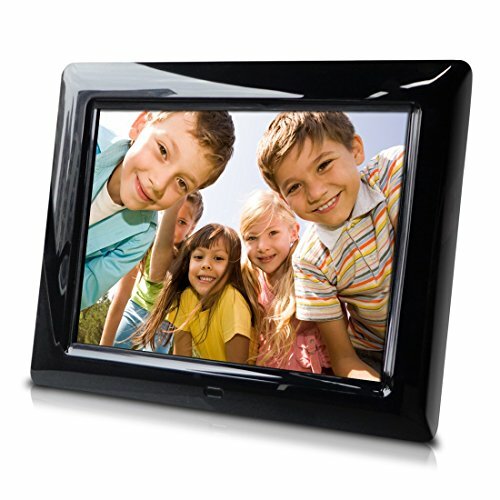 Display your favorite photos of family, friends, places, and memories on the Sungale PF803 Digital Photo Frame. Choose to view photos as a slideshow or single photo display on the high definition (800x600 pixel) 8" LCD screen. Choose from the various available transitional effects and interval time and rotate photos to preferred orientation. Plug in a SD card or Flash Drive to access and display your photos. Frame comes with a quick start guide, warranty card, and AC adapter. HI DEFINITION IMAGES - 800x600 LCD screen displays photos in brilliant detail and vibrant color. DIVERSIFIED DISPLAYS - This simple and easy to use frame allows you to choose from a variety viewing options like, slide shows, transition effects, interval time options, zoom in/out, and photo rotation. DESIGNER LOOK - Frame's glossy finish gives it a more appealing look than other frames. If you have any questions about this product by Sungale, contact us by completing and submitting the form below. If you are looking for a specif part number, please include it with your message.